JCL Hotel is an (PMS) application that lets you manage all the information generated in a house for rent rooms, hostal, motel or small and medium hotel. Reservations, rooms, clients, guests, services, fees, expenses, rooms, invoices, advance payments, collections, currency exchange and many more, quickly and easily. The application has several features that make the business work much more bearable for its users. 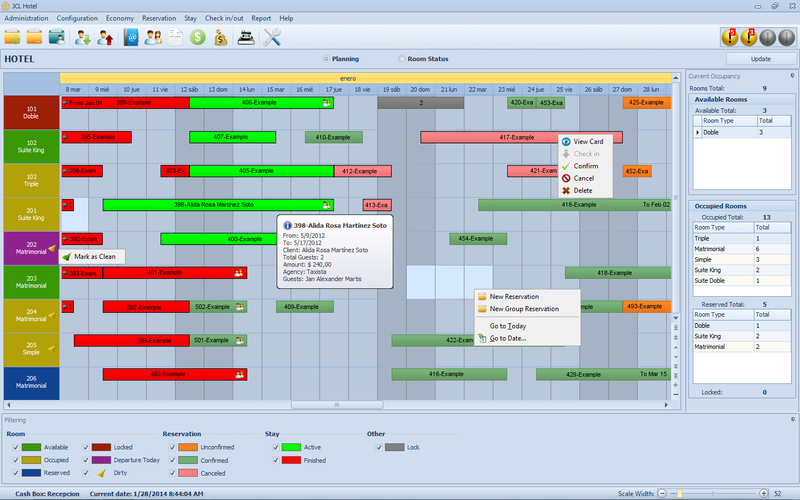 For example, features an interactive visual scheduler to control the occupation of the rooms of the facility so that we can manage with just a few clicks. In addition, we take complete control of the room's records, advanced reservations, the check-in and check-out, staff, guests. All with lots of data, we can fill options or consider in the interests or requirements of the hotel. In the same way that we can keep track of guest rooms and we can do the same with the rates that can have them controlled all time and modifying them according to the season that interests us. JCL Hotel is a tool pretty complete for hotel management; the performances will only be truly appreciated by someone in the industry. The amount of options and possibilities is truly overwhelming.